Speaking to reporters at a post-summit press conference following the historic meeting with North Korean leader Kim Jong-un in Singapore on Tuesday, US President Donald Trump said he hopes the Korean War will finally end. 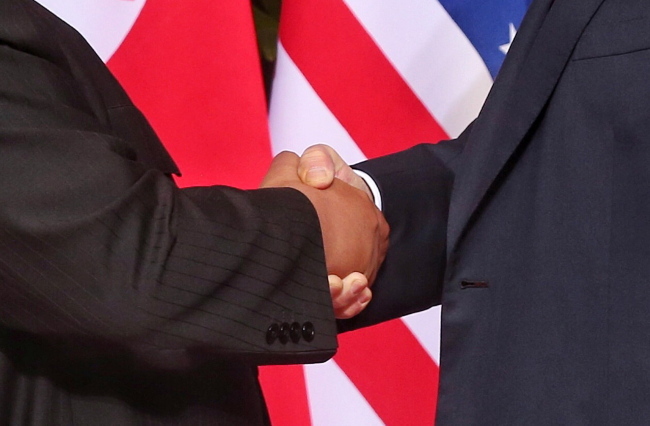 Bringing a formal end to the 1950-53 Korean War, which ended in an armistice, is widely thought to be a first step to guaranteeing the North Korean regime’s security. “While the armistice was agreed to, the war never ended to this day, never ended. But now we can all have hope that it will soon end. And it will,” he said. The two Koreas pledged to declare an end to the war during the inter-Korean summit in April, and Trump had said that the two Koreas had his “blessing” for discussing it. A declaration to the end of the Korean War, however, was not mentioned in the agreement signed by Trump and Kim. The two also agreed to commit to establishing “new” bilateral relations and making joint efforts to build a “lasting and stable peace regime” on the peninsula without specifics. Though Trump said the summit was “as good for the United States as it was for North Korea,” his pledge to suspend the joint military exercises and pursue an end to the Korean War has sparked concerns the US gave up too much for too little in return. Trump said Tuesday that the US will freeze its military exercises in what is seen as a major concession for North Korea. “Under the circumstances where we’re negotiating a very comprehensive agreement, I think it’s inappropriate to be having war games,” he said. The North has denounced the joint drills as a rehearsal for war. In May, it threatened to pull out the summit with the US, citing Seoul-Washington’s Max Thunder drills. “The statement does not have any specifics about North Korea’s steps to denuclearization, but Trump already offered to suspend South Korea-US joint drills and even hinted at the withdrawal of the US troops from South Korea,” said Shin Beom-chul, a senior researcher at the Asan Institute for Policy Studies. He said that “at some point” he wanted to withdraw US troops from the South. There are about 28,500 American forces stationed in the South to deter North Korea’s aggression. Conservatives in the South see the exercises and stationing of the US troops in South Korea as the centerpiece of the security alliance between Seoul and Washington. Hong Min, a researcher at the Korea Institute for National Unification, played down the concerns, saying Trump’s pledges would only be realized when North Korea takes steps to denuclearize. “Suspending joint military drills was one of the key rewards for North Korea in return for denuclearization and I didn’t expect it to happen this early,” he said.